IT departments and mobile app developers are no longer worlds apart. Thanks to low-code tools, back-end integration, and DevOps, admins may end up stepping into a developer's shoes. 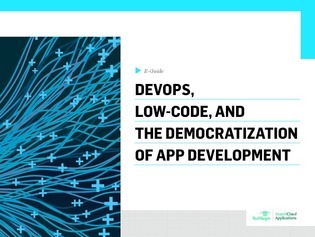 In this expert e-guide, learn about the debate around which parts – if any – of app development should be handled by LOB employees and IT professionals other than developers themselves. Enter the discussion and find out how DevOps and no-code/low-code tools are reshaping the way cloud and mobile apps are being built.